What happens to Serviceable Equipment? It is our aim to achieve 99% success in recycling the equipment. However, at your request, if your fully functioning equipment meets current PAC test standards, we would endeavour to redeploy it within various local community projects, charities and worthy causes. How does the Recycling Service Work? RCS Recycling have 30 years working with corporate clients removing redundant equipment and materials from around the UK. We collect your redundant equipment at your convenience with minimum disruption to your office and staff. Any non-working and lower specification equipment is sent to our licensed metal recycling and waste management service partner. They guarantee that all electronic waste, glass and plastic is recycled to the highest European and UK environmental standards, with no waste material going to landfill. All material has full traceability and De-manufacture and Destruction Certification is issued as a standard procedure. Anything! 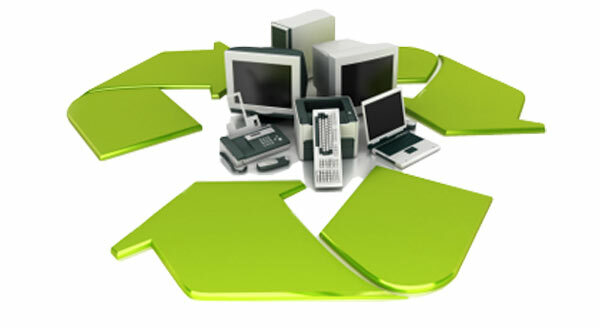 RCS will collect and recycle any redundant office equipment or materials from anything IT based to chairs or furniture in addition we also dispose of non technical packaging materials and general clutter. Just phone or e-mail us with your requirements. Do you have a Minimum Quantity/Charge for Collection? Unlike some recycling companies, we do not have a minimum quantity or minimum charge for collection. Just phone or e-mail us with your requirements. Will all my Company Data be wiped from hard drives? It is our normal practice to shred hard drives, ensuring total destruction. We guarantee complete removal of all data and provide you with Final Destruction Certification for all equipment collected as standard practice. Will I be supplied with any Certification? We will supply you with Data Destruction Certification listing all storage units which have been destroyed. We can also supply a full Audit of hard drive and equipment serial numbers and asset tags if required. Certification of Secure Disposal is supplied Free of Charge for all materials and Hard Disks and materials collected.